Cambridge is often admired for the way it has succeeded in attracting research-led investment and employment growth, much of it associated with the university. This success has also seen essential infrastructure including housing built. Oxford has made slower progress. What then can Cambridge teach us? Oxford Civic Society decided to send its own mission to Cambridge in spring 2016 to consider what has been working in Cambridge and what could or could not be applied in Oxford. 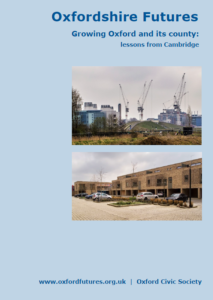 The group concluded that Cambridge’s success story has much to teach us – about the role of local government, the contribution of the university and the dedication of key individuals committed to finding a shared vision. We have produced a short report summarising our findings. You can read this online on the Oxfordshire Futures website, or download a copy of the report as a pdf here.